“Penny Candy” Christmas Quilt. Pieced and quilted by Anita LaHay of Daydreams of Quilts. Pattern by Kathy Brown from her book “Strip-Smart Quilts”. Fabric is “Holiday Happy” by Monica Solorio-Snow of the Happy Zombie for Lecien fabrics. I have the Finish Along to thank for spurring me on (and cheering me on!) to get it finished. It’s been on my list all year including my Q3 goals list (#2). One more photo just to be sure it’s real. This was one of the bigger quilts I’ve sewn and the idea of quilting it was daunting so it sat for a few months. Then one day, inspiration struck and I had it quilted in two days. This year I finally figured out what I was doing wrong with my Juki and it’s been working like a charm ever since. The problem was I kept putting the bobbin in running clockwise when it has to run counter clockwise. Such a simple thing but it drove me crazy for months! Soooo happy I finally figured it out! 🙂 It was the answer to a prayer let me tell you. Here is the cozy flannel back. I bought this blue polka dotted fabric from the “Quilter’s Quarters” quilt shop in Edson on the way to Jasper for our annual May trip to the mountains. It’s so soft! Thank you for coming by my blog to see it. Linking up with the Linkys: “Sew Cute Tuesday”, “Fabric Tuesday” and “Let’s Bee Social”. Congratulations Anita! 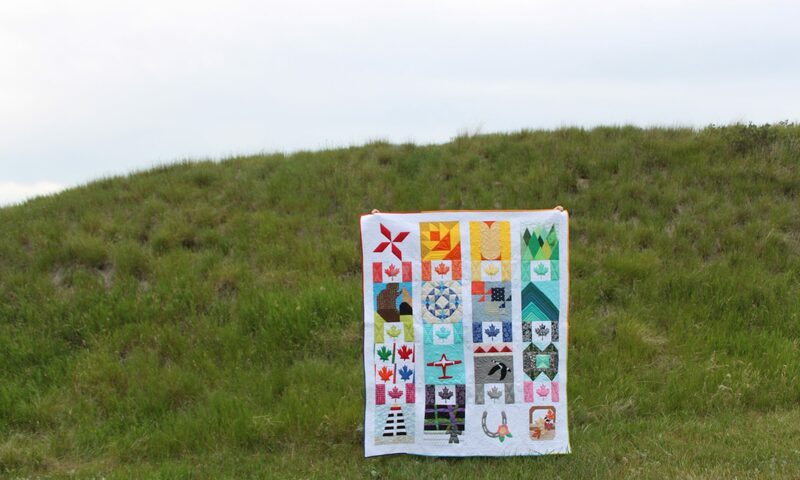 This is super sweet and the quilting is beautiful! Really pretty fabrics and a lovely design. You will be smiling under this quilt while looking at those Christmas lights this year. Looks great, congrats on your finish – very rewarding after a while on the go. Penny Candy is such a sweet Christmas quilt Anita! Good things come to those who wait, LOL. It's so satisfying to get a seasonal project done ahead of time! I find the quilting daunting too, so I can relate. Nice job on the quilting. I love the soft holiday colours in this quilt and the pattern is one of my favourites! I'm visiting as a member of the official 2015 Finish-Along cheerleading squad.